Ships in two cartons—ORDER BOTH. Commercial-grade. Minimal assembly required. Integrated 4-port USB hub. Finished approach side. File drawers accommodate letter, legal-size or A4-size files. Drawers feature full-extension ball-bearing slides. Includes wire management. Enterprise Collection L-Desk for transitional styling that creates a professional impression anywhere. Constructed with 100% thermally fused laminate for durability and superior resistance to scratches and stains. This L-Desk provides an integrated 4-port USB hub in the desk to connect electronic devices. Our dual pedestals offer metal drawer pulls for contemporary styling and durable edge banding to resist dents. One pedestal has a top drawer, storage compartment with an adjustable shelf and self-closing Euro-style door hinges. Two additional file drawers in the second pedestal, accommodating letter, legal or A4-size files. Full-extension ball bearing drawer slides and suspension allow easy access to files. 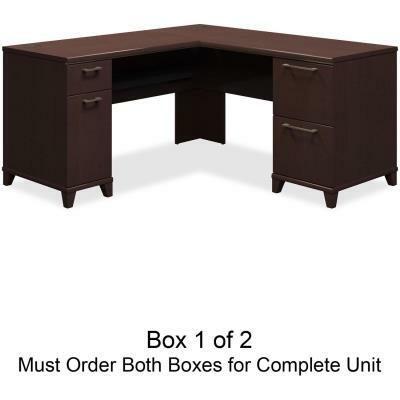 Desk and Pedestals sold and shipped separately—ORDER BOTH.